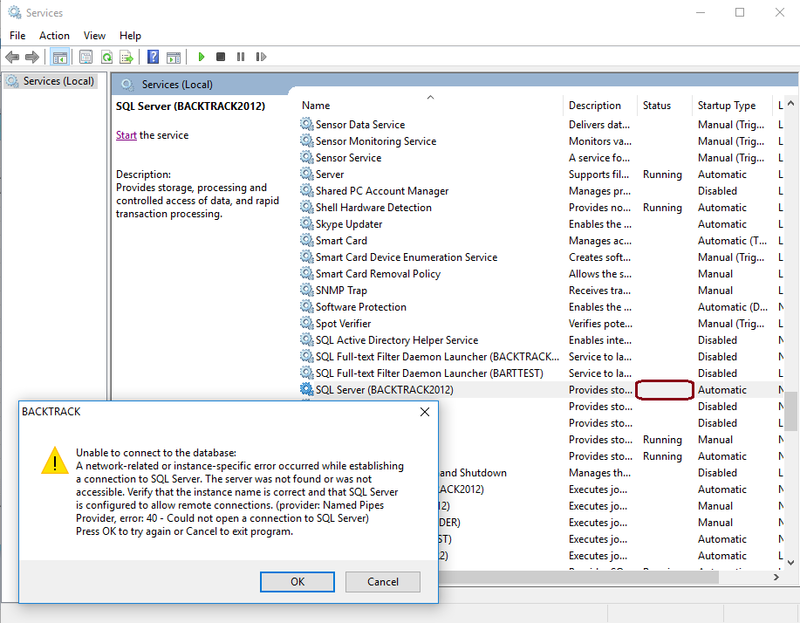 This Error Message Article explains the BACKTRACK error message “Unable to connect to the database: A network-related or instance-specific error occurred while establishing a connection to SQL Server….error: 40 – Could not open a connection to SQL Server…” and details how to fix the underlying problem that caused it to appear. There is a communication problem between client workstation (BACKTRACK) and SQL server the system where the data for BACKTRACK is stored. An incorrect configuration of database connectivity could be the cause. A BACKTRACK client workstation is unable to connect to the database. In this case, ‘Shared Memory Provider, error: 40 – Could not open a connection to SQL Server’ indicated that the SQL instance was unable to be opened due to the SQL instance service being disabled. The location for the license information can be found on the BACKTRACK server at c:\programdata\Teklynx\BACKTRACK\btwdata.ini . Confirm that the the SQL Server Network Configuration has Shared Memory, Named Pipes and TCP/IP Enabled.